The purpose of this book is to provide an overview of important principles and concepts in the field of thermodynamics, written in a fashion that makes this abstract and complex subject easy to comprehend. Concepts and principles are presented in a way which also will allow many non-engineering professionals with some math background to follow the material and gain useful knowledge. Thermodynamic topics including enthalpy, entropy, latent and sensible heat, heats of fusion, and heat of sublimation are clearly presented. Also covered are phases of substances, the law of conservation of energy, SFEE, the first and second laws of thermodynamics, ideal gas law, and respective mathematical statements. The author provides an examination of specific thermodynamic processes, as well as heat and power cycles such Rankine, Carnot and the differences between them. 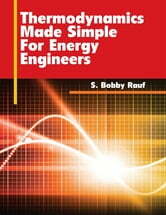 Case studies illustrate various thermodynamics principles, and each chapter concludes with a list of questions or problems for self assessment.